Place a convenient home for bluebirds in your bird habitat with the Heath Large Cedar Bluebird House. This traditional roost enhances the natural feel in your backyard or on your farm, with its all cedar construction and classic shape. A 1.5" diameter entrance hole rests near the top of the front panel, and the roof overhang protects the entry from rain. Ventilation gaps on two sides of the roost help regulate the interior temperature, and gaps on each corner of the floor allow any captured water to drain from the nest. The back of the unit extends upward past the roof, and two predrilled holes here allow the home to mount to a fence or wooden post with the included screws. For more mounting options, place a 4.5" diameter or smaller mounting plate on the base of the piece, and situate it on a pole. Open the side panel of the home to check the nesting activity regularly, and for seasonally cleaning the item. Its rot resistant, all cedar construction is perfect for use for several seasons, and the natural grain lends drama and style to the roost. 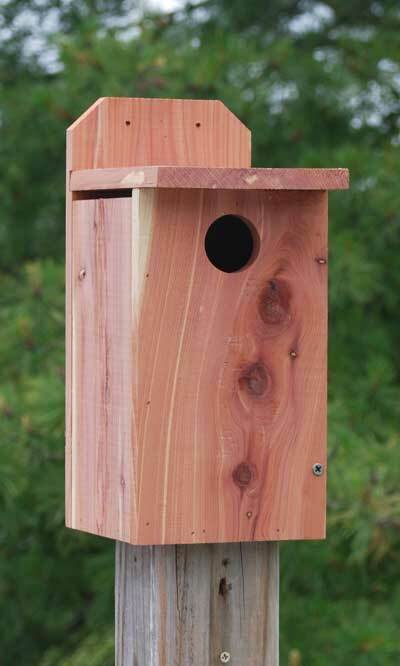 Add a bluebird nest box to your bird garden with this Large Cedar Bluebird House. Note: Due to the natural wood construction, individual homes may vary in appearance regarding knots, grain, and color. These do not affect the use or structure of the home, and are not considered defects.